I am a new comer in the world of peoplesoft, please guide me from where i have to start. i have 5 years experience of development of Oracle EBS. This isn't an easy question to answer, so perhaps if you could expand on what you would like to know? Are you looking at picking up development, sysadmin or functional skills? Which product lines are you working with (e.g. HR, Finance, Campus Solutions). I have 1 year technical experience in peoplesoft,.also have 2 years java exp. 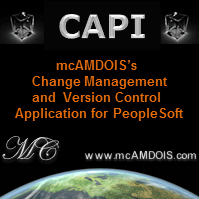 I have also done peopletools certification.i have no functional knowledge regarding any module. can anybody suggest me,what are the options which brights up my career as a good PS techie.weather i should take any course or certification.or what the topics to concentrate.